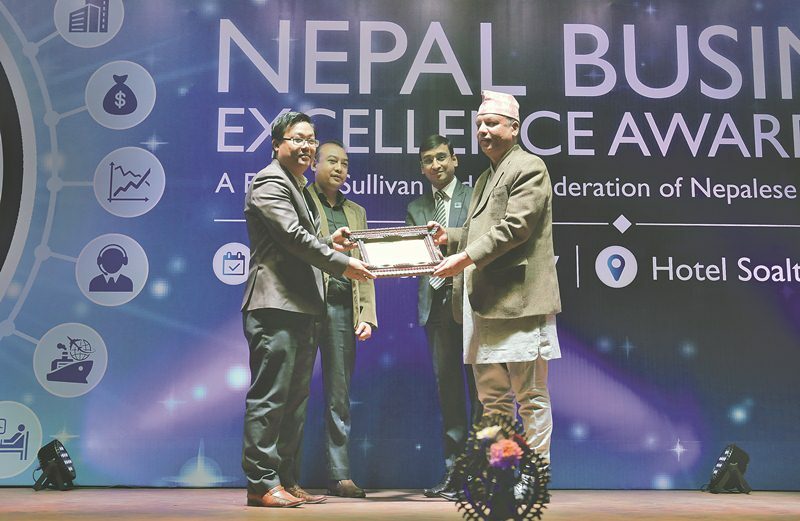 NIBL Capital Markets Limited was honored with ‘Certificate of Merit’ in NEPAL BUSINESS EXCELLENCE AWARDS 2O17 hosted by ‘Frost & Sullivan’, a global consulting firm based in the United States along with ‘Confederation of Nepalese Industries’, one of the largest private sector umbrella bodies, in the event held at Soaltee Crowne Plaza, Kathmandu on Tuesday, November 14, 2017. Nepal Business Excellence Award 2017 is the first ever edition of Frost and Sullivan’s Best practice award in Nepal. It is a platform designed to incisively assess and highlight focus areas to business leaders that will help them build sustainability in their businesses and recognize companies who have demonstrated deployment of sustainable and investor friendly business models. The performance assessment was based on five model, which are globally recognized, according to Frost & Sullivan. These assessment models are Business Planning, Strategic Alignment and Deployment, Supportive Organization and Reliable Processes. Frost & Sullivan’s analyst team had visited NIBL Capital on 1st and 2nd November for the assessment.